Summary: One minute sixteen-year-old Ruby Morris is having her first proper snog with Caspar McCloud in a hot tub, and the next she’s being bundled inside the house, dripping wet, cold and in her underwear. Not cool. As she and Caspar shiver in the kitchen, it starts to rain. They turn on the radio to hear panicked voices – ‘It’s in the rain . . . it’s in the rain . . . ' That was two weeks ago, and now Ruby is totally alone. People weren’t prepared for the rain, got caught out in it, didn’t realize that you couldn’t drink water from the taps either. Even a drip of rain would infect your blood, and eat you from the inside out. Ruby knows she has to get to London to find her dad, but she just doesn’t know where to start . . . After rescuing all the neighbourhood dogs, Ruby sets off on a journey that will take her the length of the country – surviving in the only way she knows how. Review: Ruby Morris’ perfect evening making out with Caspar was ruined by a typical British downpour of rain - toxic, deadly rain that would kill you if you touched it or drank it. It sent the whole of Britain into an apocalyptic panic, with the streets full of dead bodies, and looters, and the average person forced into desperate situations. Running through the plot was high-level tension and a very real sense of fear and danger around both the weather and other people. So much so that I actually scared myself silly when I saw real rain clouds outside. Ruby started the story as a vulnerable teenager with very little clue or common sense – dying her hair and clothes shopping still remained fairly high on her priority list despite the constant danger, which frustrated me a little. But as she tried to find water, safety and her father she had to become more independent. My favourite part of the story was her relationship with her stepfather Simon. Her dependence on him really brought them together and changed the way she saw him, not as an intruder in her family but as an actual father figure. Ruby’s narrative voice was brilliant and so well written that she was completely believable as a teenager. This hooked me into her story, the high-tension situations and her desire to survive. There were some really sad, heart wrenching moments for Ruby and I felt them all with her. As I neared the end of the book I was worried what route the story might take – happy ever after, open ending, dramatic conclusion etc. All I will say is that I was personally satisfied and relieved with the ending and felt it fit the rest of the story. 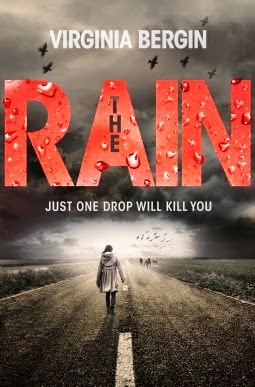 Tense, scary, and high emotion, The Rain will have you on the edge of your seat and afraid to step outside. This sounds REALLY interesting. Colour me intrigued.